Share the 2018 Moving Checklist to Start Capturing Seller Leads in Your Market. Write a blog article on moving best practices. Upload the checklist and allow leads to download the checklist after they fill out a lead capture form. Email the checklist to seller leads as soon as they place their home on the market. 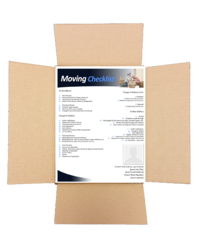 After a listing appointment, leave sellers with the checklist along with other marketing pieces to streamline their move.